Our customer in Wayland MA was adding a half bath to their home but had space constraints. The solution was this corner mounted pedestal sink. 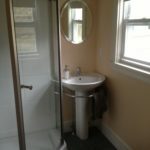 The bathroom is functional and stylish. Choosing a custom sink like this provided the customer with just that much more space. When working in small areas, every little bit helps. 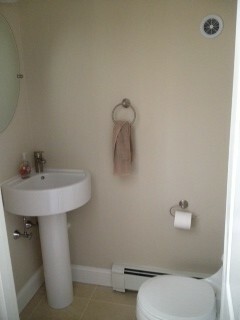 They also chose a round toilet bowl to help create even more space. We specialize in all types of bathroom remodels. Call us at our Framingham office to discuss your ideas. 508-875-2593. Our estimates are always free… let us help you kick start that bathroom renovation that you have been thinking about. We installed this A.O. 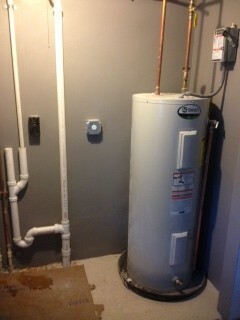 Smith electric hot water heater in a new utility room in Framingham MA. Our customer added a laundry area to the room as well. This house is a Campanelli slab and had no basement access. With the help of our team of subcontractors, we were able to locate the underground drain, professionally cut the concrete floor and connect all the drain work. We have been creatively working in slab homes for many years. Our experience pays off in situations like this. Our team can assist you with all your custom plumbing needs. Call our Framingham office at 508-875-2593 to set up an appointment. Estimates are always free. Emergency hot water tank replacement in the basement of this Framingham home. Our customer noticed a small spot of water on her floor and called us immediately. We responded and found her existing tank was leaking. We were able to drain and remove the old tank and replace with a brand new A.O. Smith 50 gallon electric hot water heater with a 10 year warranty, before there was any water damage to her basement. Remember to check the area around your water heater for any sign of moisture. A keen eye and quick response can save you lots of work and headaches down the road. 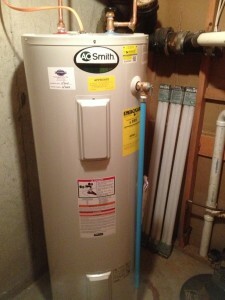 Call us at Joe Kaufman Plumbing at 508-875-2593 for a free hot water tank inspection.